It’s rare that the world’s potato scientists get a chance to weigh in on a pop culture item, since their favorite little tuber rarely plays a role in Game Of Thrones or a superhero movie. They must’ve been pretty excited, then, when they saw Ridley Scott’s 2015 film The Martian, a significant chunk of which revolves around Matt Damon’s quest to grow potatoes while stranded on Mars. 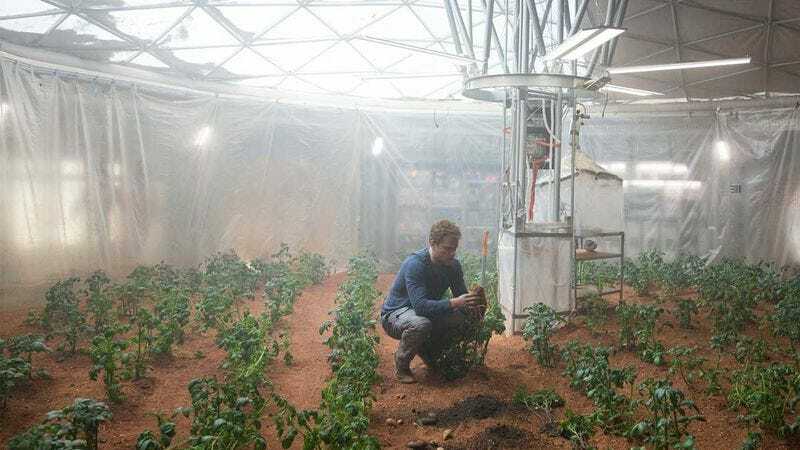 Naturally, the International Potato Center jumped at the chance to study whether or not potatoes would actually grow on Mars, and now a story in Discover Magazine (via Uproxx) explains their findings. So was The Martian scientifically accurate, specifically regarding its depiction of potatoes? More or less! Basically, the researchers used science to create a hearty potato that could survive the conditions on Mars, and after helping it out with special fertilizers and a little bit of Earth soil (in case the potatoes get homesick, we assume), they were able to make them grow. As the Uproxx story notes, that means potatoes can now join tomatoes, rye, garden cress, radishes, and peas on the list of vegetables that can theoretically grow away from this ugly sphere of dirt and water we currently live on. Also, to be fair, the Discover story doesn’t actually reference the Ridley Scott movie at all, so this study and the use of potatoes in The Martian are probably not related, but at least we no longer have to wonder if that one part of the movie was factually accurate.